After Brecht: British Epic Theater is the first book to fully explore contemporary British drama in the light of the influence of German playwright Bertolt Brecht. Focusing on the work of Howard Brenton, Edward Bond, Caryl Churchill, David Hare, Trevor Griffiths, and John McGrath, the book examines Brechtian techniques and style within the work of each playwright, while highlighting the divergent development of each. The book has been enriched by the author's in-depth conversations with the playwrights. The topics covered include contemporary politics and the theater, the National Theatre, the Royal Shakespeare Company, and such well-known fringe companies as Foco Novo, Joint Stock, Portable Theatre, and 7:84. Reinelt examines each playwright within an interpretive frame drawn from an application of Brecht's theories and practice to the historically specific situation of post-war British theater. The book will appeal to those interested in the relationship between politics and art and contemporary European theater and its antecedents. "After Brecht represents the best and most detailed engagement with the contemporary British theater scene to date." --Stanton B. Garner, Jr.
Janelle Reinelt is Chair of the Department of Dramatic Art and Dance, University of California-Davis. This is the first book to fully explore contemporary British drama in light of the tremendous influence of German playwright Bertolt Brecht. The book is informed by the author's in-depth interviews with the featured playwrights; topics include Brecht and his influence, contemporary politics, the theater, and the six playwrights' work with the National Theatre, the Royal Shakespeare Company, and well-known fringe companies such as Foco Novo, Joint Stock, Portable Theatre, and 7:84. "This fine study . . . confronts issues that are important to all students and practitioners of the theater. 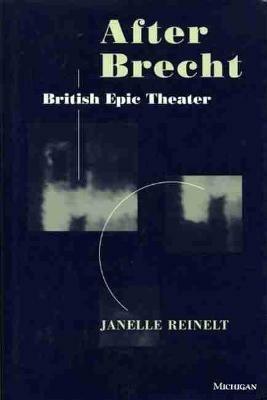 Sensitive to the uniqueness of each of the playwrights in her study, Reinelt demonstrates that Brechtian theory can be modified in many ways by those who share the belief that 'politics and aesthetics are inseparably linked.'" -- (04/07/1999) "After Brecht represents the best and most detailed engagement with the contemporary British theater scene to date."